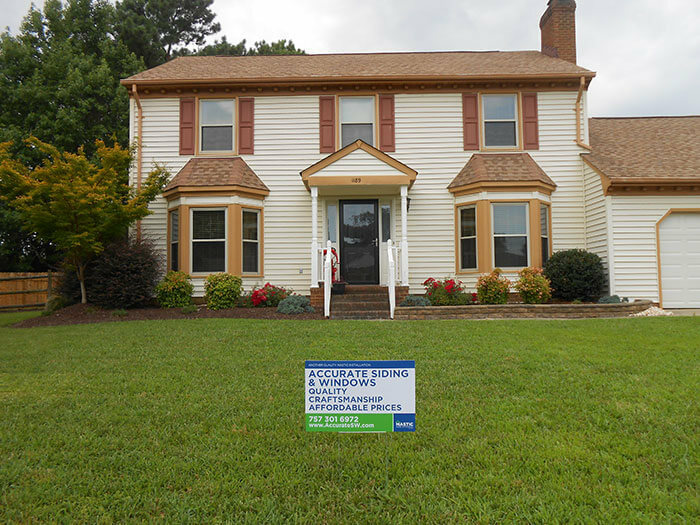 Accurate Siding and Windows for spectacular home window replacement service in Virginia Beach. Replacement windows may seem or sound like a daunting proposition. However, the benefits you stand to gain by doing so, can make a big difference. Some of replacement window benefits include: 1. Improved energy efficiency – Many homes still have the original single pane glass windows. These do not offer any insulating properties; therefore, they lead to higher energy costs. Replacing these old windows with modern energy efficient options can save you up to 25% of your energy bills. 2. Noise reduction – if you live in an area where there are high noise levels, home replacement windows with a dual pane glass or laminated may drastically reduce the noise levels in your home. 3. Improve curb appeal – replacement windows can greatly alter the overall appearance of your house. 4. Improved safety – if your windows regularly freeze shut, they can pose a great danger to you and your family in the event of, say, a fire. Getting them replaced by a window replacement company will give you peace of mind and improve the safety of your home. 5. Eliminate the need for maintenance – most home replacement windows come with an additional exterior trim. These trims do not require painting and thus saves you from any maintenance. • Damaged, warped and broken windows – if your windows are showing signs of damage, are broken, are stuck every time you try to open them, fog up etc. it might be time you got in touch with a window replacement company. • You have high energy bills – the average American home spends well over $1,000 dollars per year on cooling and heating bills. Drafty windows can account for up to 10% to 15 % of this energy bill. Window replacement can drastically reduce your energy bills annually. Good replacement window companies will tailor the replacement windows, giving you ones that to best suit your climate and location. • Your current windows distract from the overall house appeal – windows are prominent features for any well-designed house. If you are looking to put your house on the market or are just looking for a makeover, consider how your windows look from the outside. If you notice any fading in color or warping of window material, it may be time to seek home window replacement. • You live in a severe weather prone area – anyone living in an area that is prone to severe weather events such as tornadoes, hurricanes etc should pay special attention to the condition of their windows. Contacting a window replacement company and getting replacement windows may lessen the damage during these events as well as your expenses whenever they occur.